We've published some spectacular wedding styled shoots in 2017. To see out the year, we've put together our faves for you to devour. This year we have seen way more than our fill of spectacular Sunshine Coast wedding style. Heck, we’ve even conjured up and created some ourselves! Our tiny team of two have organised no less than seven styled shoots to fill the pages with unique and innovative wedding ideas and styles to help you plan your dream day. This year we have definitely put together some of what I’m sure will remain in our all-time faves for years to come. We have also had some incredible talent find its way to our inboxes, which we’ve shared with you on this here blog or in our magazine, our enewsletter and on social media. We spend our days dreaming up and hunting out ways to inspire you on your wedding planning journeys, our darling Sunshine Coast brides and we consider ourselves extremely fortunate to do so! To send out the year, I thought I’d share a bunch of our favourite styled shoots from the year that was. 2017, you were very pretty indeed. Let’s see if 2018 tops you – gosh, that will be a challenge! Brides, please stay safe and sound this New Year’s Eve. We look forward to bringing you more Sunshine Coast wedding inspo next year after a short break. Until then, savour pouring over these incrediballs styled shoots! Kicking off 2017, we shared our take on a Palm Springs style wedding on a Mooloolaba rooftop. This was a very eventful shoot atop Emu Mountain with an alternative Autumnal bridal style complete with black lace two-piece gown and distressed florals on a mountainside. Good food, relaxed vibes, waterfront location. These are all key elements to creating a Mediterranean-style wedding. 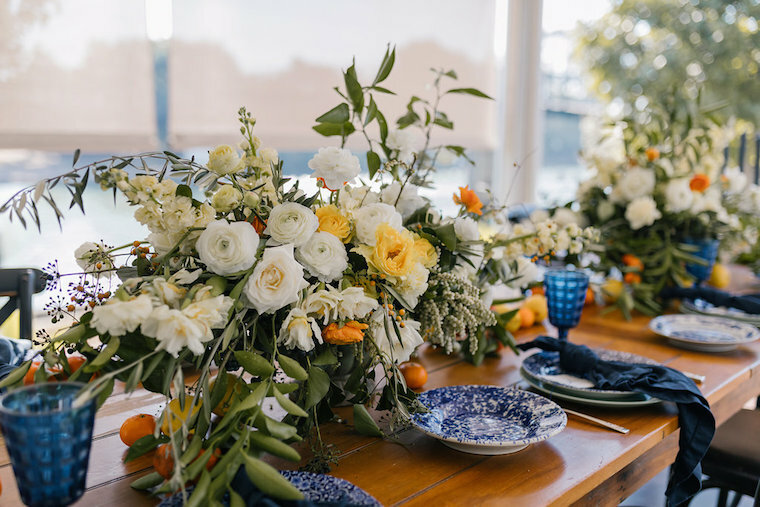 Adding fresh white florals with abundant greenery and pops of yellow and blue, we created a Noosa wedding at one of its most famous Italian restaurants. For our last magazine of 2017, we worked with some of our fave local vendors to create a Spring Awakening. Soft and romantic in style, our luxe styled shoot is in the Sunshine Coast hinterland, where our blushing bride and dashing groom frolicked under tents and tipis. In the lead up to A Darling Affair this year, we published this pretty-as-a-picture contemporary pink ombre wedding styled shoot. Dreamy decadence in a natural setting – this wedding inspiration shoot takes the classic colour theme of deep blue and gold, adding in some gorgeous grey tones and ivory and makes a meal of all the prettiness that ensues. The whimsical feel is heightened by the private estate location. We took a gaggle of some of our fave A-list Vendors up the Range to Weddings at Tiffany’s to shoot an opulent, romantic winter wedding inspiration shoot. Rich in colour, this moody romantic styled shoot provides much inspiration for an alternative wedding style. Drawn to the natural forest surroundings, this innovative team with a commonality of an adventurous spirit created a unique forgotten forrest wedding style. Inside the barn at Yabbaloumba Retreat, some of our incredible local vendors styled a bridal shoot for an elegant rustic country wedding. We worked with some local experts to create a luxe wedding at Twin Waters Golf Club with loads of styling inspo. Images by Terri Hanlon Photography. Lush and green in the gardens of the Flaxton Gardens property in the Sunshine Coast hinterland, dreamy and contemporary for an Autumn Wedding. Fab! So many amazing images all year round as always!